The District Attorney for Travis County, Texas, has been arrested for drunk driving and entered a plea of guilty. Travis County is better known for its main city, Austin. 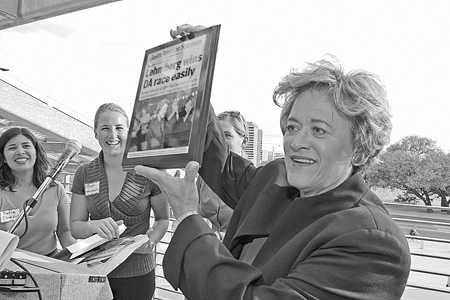 Ms. Lehmberg has been a prosecutor for nearly 40 years. Read more about her arrest for DWI (the term in Texas) and her quick guilty plea at the Austin Statesman. While we would usually be harsh on a prosecutor getting a DUI, Ms. Lehmberg seems to have been relatively reasonable in her career. We couldn’t find any stories about her bragging of being tough on crime, nor of her identifying with MADD or otherwise grandstanding on the DUI issue. In some ways she has been a leader on diversion in drug cases. Diversion favors education and treatment over jail and the scarlet letter of a conviction. Since this is similar to our goals for DUI cases, we wish Ms. Lehmberg the best in this difficult time. This entry was posted in Texas on April 15, 2013 by wredlich.